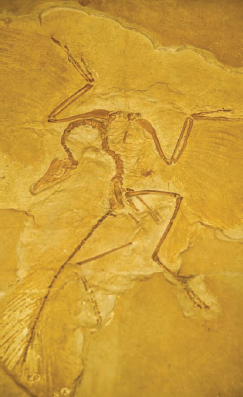 Did some scientists believe Archaeopteryx lithographica was a transition between dinosaurs and modern birds? Yes, some scientists once believed Archaeopteryx was the transition between dinosaurs and modern birds, mainly because the fossilized skeletons exhibited a mixture of dinosaur-and bird-like features. The dinosaur (or reptilian) characteristics include such features as bony tails, teeth, and claws on the fingers; the bird-like characteristics include such features as feathers, wishbones, and beaks. Today, however, many scientists believe Archaeopteryx lithographica may have just been a link in dinosaur progression, eventually evolving into modern birds. Widely believed to be one of the first ancestors of birds, the Archaeopteryx first appeared in the Jurassic period (iStock).